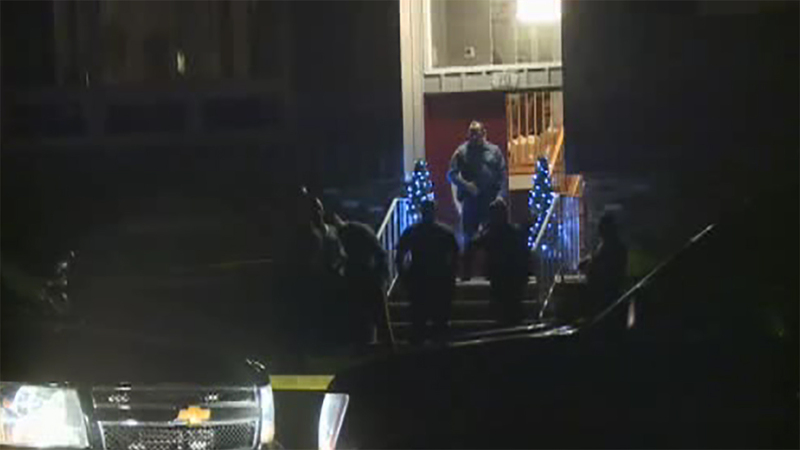 JEFFERSON TOWNSHIP, New Jersey (WABC) -- Authorities are investigating a police-involved shooting in New Jersey in which a state trooper shot a man who allegedly charged at him. The man was shot in the house on Brady Road in Lake Hopatcong just after 11:30 p.m. Sunday during a domestic violence investigation. According to the state attorney general's office, the incident began when troopers received a report of a woman walking along the shoulder of Interstate 80. When a trooper responded to assist the woman and bring her to the State Police barracks, she reported that she had been assaulted by her boyfriend while they were driving on I-80, and he had made her get out of the car. She had visible injuries on her face and body. Her boyfriend was identified as Matthew Gerndt, 35, of Lake Hopatcong. Five troopers went to Gerdnt's house to arrest him. Authorities say he allegedly charged aggressively at the trooper who was in the lead position, who subsequently fired two rounds from his service handgun, striking Gerndt once in the lower body. Gerndt was taken to Morristown Medical Center with a non-life threatening injury. He has been charged with assault and resisting arrest. The investigation into the shooting will be conducted by the state attorney general's office.